Scivation Xtend is one of the top selling intra workout supplements on the market. With its basic yet effective ingredients, it is easy to see why Xtend is the go-to supplement if you need nutrients to fuel your workout process. Scivation manufacture a more than healthy list of flavours, which stretches 10 deep, here in Australia. If you are at all curious as to which flavour is the best, then this article is for you. 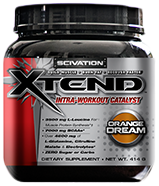 We are counting down the top five best flavours of Xtend. too far from your comfort zone. If you’re a first time buyer, this could be a good one to start with. Not too far after Orange Dream comes Grape Escape. When you try Grape Escape, it becomes very apparent that Scivation is an American company. If you have ever tried grape soda before, you would instantly be familiar with Grape Escape flavoured Xtend. Luckily for us Aussies, most of us seem to agree with the Americans on this one and feel that this is actually pretty tasty, even if it was designed for the American pallet. The first surprising thing about Green Apple Explosion is that it is much sweeter than you would expect. Yes, it certainly does taste like green apple, with the very distinctive apple-juice-like tang. But don’t expect the flavour to be subtle or bland. More like candy apple, this would be one for those with a sweet tooth. Very much close to the top of the list is Watermelon Madness. This is a fantastic flavour for those who know what they want. Often, some people feel that watermelon flavour is nice, but gets a bit much if you had to drink it day in day out. However, Scivation have done very well with this one, and we do believe the watermelon lolly flavoured Watermelon Madness is worth at least one purchase. On the top of the list is Lemon Lime Sour. As you can tell from the name, this is the least sweet flavour from the list. Definitely the most tangy, the lemon lime flavour is the most popular flavour in Australia, and sees a strong following of repeat purchasers. Perhaps the reason for its popularity is that it tastes a little like good old pub squash. Definitely give this one a go.